Senator Votto: McCleary said you were brutal. Senator Votto: I want you to hurt them. 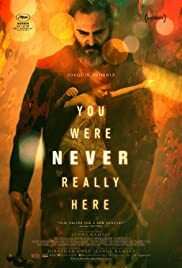 Joaquin Phoenix stars in, You Were Never Really Here, a movie that beckons memories of Taxi Driver. 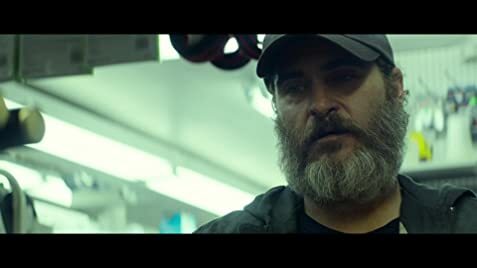 It's an apt comparison since the two movies are deep character examinations, and Phoenix's character in this film, Joe, certainly shares similarities with Travis Bickle, Robert De Niro's famous taxi driver. The two men both have traumatic pasts that inflicted irreparable damage on their mental health, and both men currently live unsatisfying lives. The main difference is that Travis Bickle attempted to make an honest living driving a taxi for a time before he, well, you can watch the movie and find out what he did. But, Joe's way of making a living is unlawful from the beginning of the film. However, he did initially attempt a lawful career years before the film's opening scene. I'll get there. Joe is a hired gun whose job is to hunt down missing girls, bring them back, and punish those that captured them. It's work not for the feint of heart. When asked if his methods are rough, Joe replies, "I can be." He's being modest. Joe brutally disarms, injures, and kills anyone standing in the way of his missions. His preferred weapon: a ball peen hammer. Despite all the killing, he's not a bad guy. He cares for his elderly and often confused mother. The work he does, while often gruesome and heavy on killing, is for what most would agree is a good cause. Few could retrieve the girls the way Joe does and even fewer would be willing to do so. Joe takes no joy in any of his work. He takes no joy in any of his life. He continues forward out of some sense of duty. He fantasizes often about suicide and attempts on occasion, only stopping when he remembers his mother or the girls in need of help. He often experiences vivid flashbacks and fantasies that blur the lines between what's real and not. The audience doesn't always know, and Joe doesn't always seem so sure either. He's constantly haunted by memories of his past as a child, a soldier, and an FBI agent. Each phase of his life left him scarred physically and emotionally. Phoenix is one of the most enigmatic, fascinating, and excellent actors of the past 20 years. It's hard to imagine other actors pulling off a performance like this one. He deserves commendation for his work, as does director Lynne Ramsay. Fair warning: the movie is occasionally brutally violent and is often very confusing. It's not for everyone. 53 of 107 people found this review helpful. Was this review helpful to you?